Ahh, tomatoes. What temperature is right for them? Have you ever made tomato water? It's the clear liquid strained gently from a ripe tomato, and one of the best treats of summer. When made from juicy, vine-ripened tomatoes, it has a sweet yet green-tomatoey taste that is so intense that a little goes a very long way. Making tomato water is very simple. All it requires is a blender or food processor, a fine mesh sieve, paper towels, and patience. What you do with the resulting water is up to your imagination. 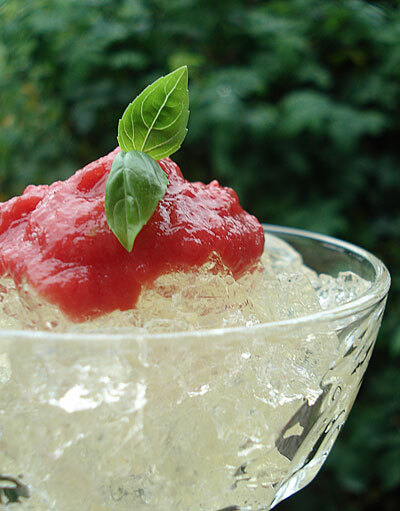 Here I have added a little gelatin to make it into a tomato gelée (or, to be non-fancy, jelly). Served on top is a tomato coulis made from the pulp that is left over after the water is strained. The only heat-adding cooking involved is in melting the gelatin. It fits in well with my minimal-cooking mood this summer. This would make a very interesting first course for a summer meal, or an amuse-bouche if served in tiny portions. It would be a great in-between courses palate cleanser too, if you are having an elaborate meal. I haven't been posting a lot of recipes here recently. This is mainly because I haven't actually been doing a lot of full-on cooking, as in hauling out a lot of pots and pans and having the oven full blast and so on. It's summer after all, and I've been enjoying fruits and vegetables as close to their natural, fresh, ripe state as possible. 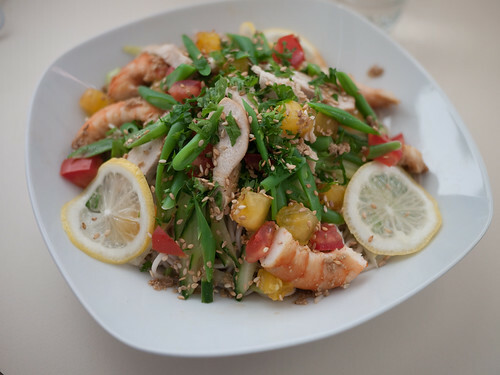 So this week I'll be posting a few such recipes - requiring minimal active cooking, full of fresh summer vegetables, and nice to have on a warm summer day or evening. 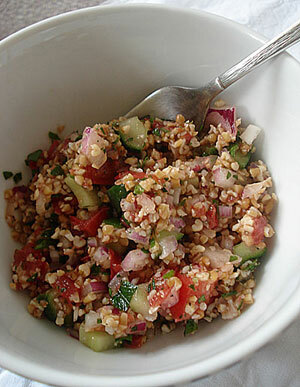 The first one is my standard recipe for tabbouleh, with a twist - instead of using mint, I use shiso (perilla). Shiso has a slightly minty but wholly unique flavor which I really like in just about anything. I also make it with a lot less olive oil than most recipes call for, which I think adds to the fresh taste. We love to have a bowl of tabbouleh in the fridge for easy self-service lunch and snacks throughout the day - it tastes so healthy and is quite filling. 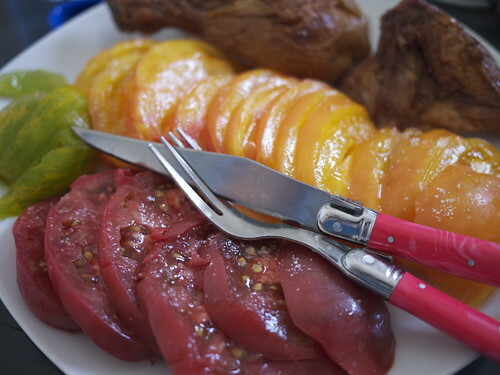 It's also a great side dish for a barbeque. Fresh tomatoes are the key to a great tabbouleh in my opinion. 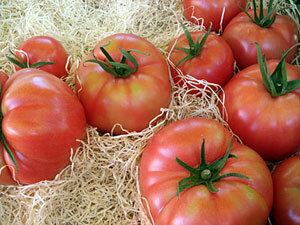 You need ones that are ripe and full of flavor, yet firm. One of my favorite tomatoes at the moment are an heirloom Swiss variety called Berner Rosen - they are a rosy pink when ripe, and full of juice and flavor. (If you're in Switzerland, Berner Rosen are all over the place at the markets right now.) If you can't get hold of a good heirloom variety like this, use cherry tomatoes, which are usually reliably firm yet flavorful. Celery isn't a very Japanese vegetable, but with the addition of the right flavors it can be turned into a refreshingly crunchy pickle that goes well with white rice, which is the base criteria for determining whether a pickle fits a Japanese meal or not. Besides, I always seem to have some celery in my fridge (who doesn't? ), and this is a good excuse to use some up. This is a nice salad-like pickle, that's best eaten with some of the pickling liquid spooned like dressing over the top. There's a nice bite and a color zing from the thin slivers of red chili pepper. (Pirikara means spicy-hot.) There's a little sake and mirin in the dressing, which gives it a twist. 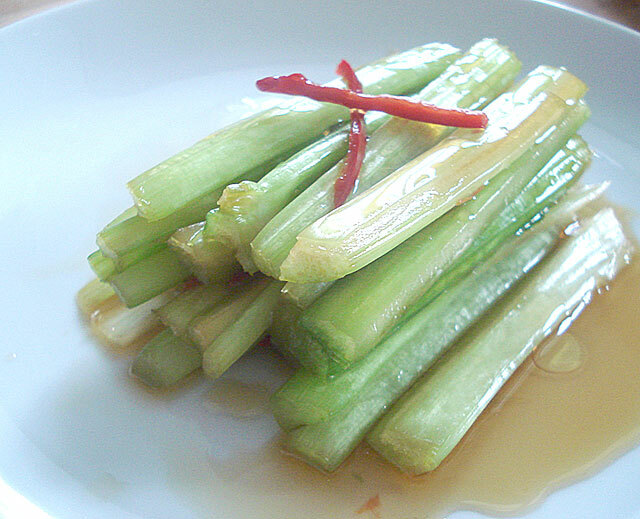 Since celery is more fibrous than cucumber, it needs to marinade for a bit longer. Give it at least 3 hours, or overnight. It doesn't keep too well at room temperature, so reserve this for eating at home. It assembles as quickly as the other quick pickles in this series. This Japanese sokusekizuke method of letting vegetables marinate in a vinegar-based marinade is similar to Western pickling methods, but there's no canning and sterilation and things involved since these are meant to be eaten within a couple of days like all quick pickles. 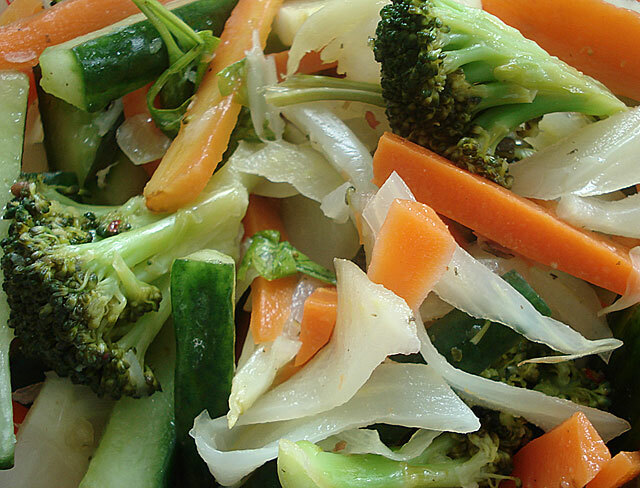 The vinegar marinade is simply meant to enhance the flavors of the vegetables rather than preserve it for long keeping. These cucumber pickles are sweet, sour and a bit salty all at the same time. The flavor is quite mild and fresh, so I can eat these several days in a row and not get tired of them. 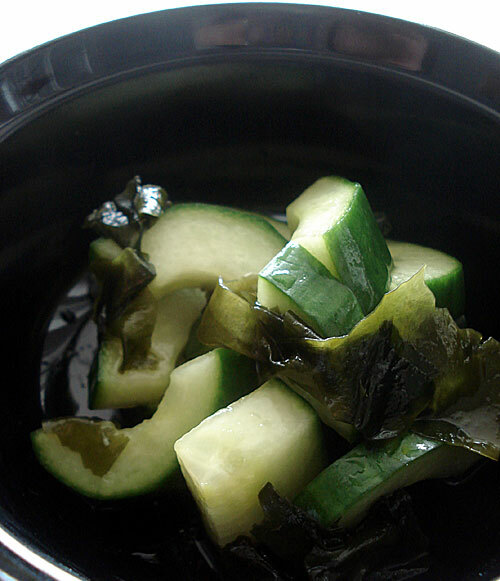 The wakame seaweed can be left out if you prefer, but makes a nice contrast to the cucumber while adding its own umami to the marinade. The pickles can be eaten anytime from a couple of hours after putting them in the marinade to about 3 days later or so, if you keep it in an airtight container in the refrigerator. 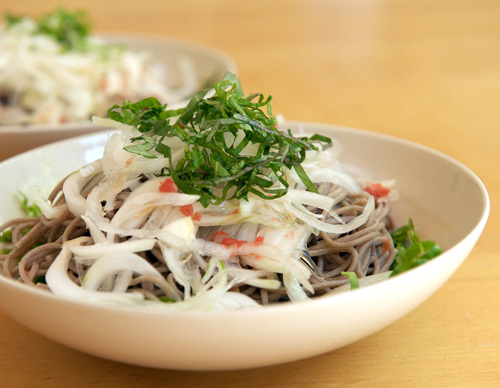 In Japan, tsukemono or pickles are used as hashi-yasume, literally "chopstick resters", side dishes that have a totally different texture and flavor. So for instance if you had some grilled meat with a sweet-savory sauce as the main course, you might have some simple, crunchy pickled cucumber slices to go with it. 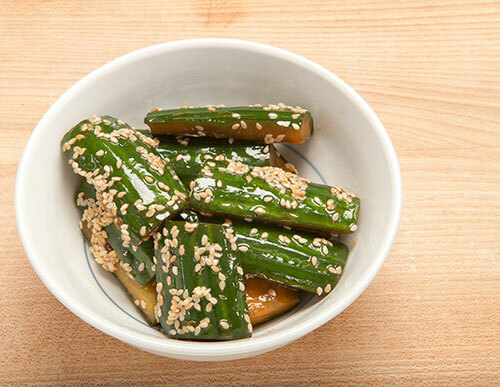 This week I'll be posting some quick Japanese vegetable pickle recipes. Japanese pickles can be very loosely divided into three kinds: the kind that take some time to 'ripen', but then last indefinitely, rather like Western style pickles; the kind that is ready in a few days, but which require a pickling bed that takes time to make and to maintain; and finally, the quick and easy kind that can be made and eaten within a day. The last two kinds do not keep well - just like fresh vegetables, they must be eaten within a short time. Quick pickles, called sokusekizuke (instant pickles) or ichiya-zuke (overnight pickles) depending on how long they take to come to full flavor, are very easy to make as their names suggest. They are a great way to prepare vegetables without having to add any additional fat, though a few recipes do call for some oil.